Having gone through a life-altering medical issue or injury, it is understandable that you can’t wait to get out of the hospital and back home. However, it is possible that you haven’t recovered enough to take care of you on your own. Hence the need for a high-grade rehab center. Of course, you’ll be spending only a short time here while you get back your strength. But, should you choose to stay at The Bridge Care Suites, you will find that the transition from hospital to home is seamless and free of worries. To help you recover completely, we have a team of expert therapists who can assist you through every aspect of the rehabilitation. In case you have had a stroke, knee or any other joint replacement surgery, or an injury, you will need extensive physical therapy. Under the supervision of an expert physical trainer, you will be exercising the affected areas to regain optimum movement, strength, and confidence in you. Accordingly, you might want to look for a facility that has the necessary equipment to help with the physical training. Like for instance, learning to maintain your balance when walking, raising stamina and endurance, improving your range of movement, and coordinating motion for day-to-day activities. Before your surgery or injury, you probably never thought much about getting out of bed every day, using the bathroom on your own, showering, and getting dressed. Brushing your teeth is a task that people go through without thinking twice. But, an injury can change all that. You might need to relearn all those movements that you made mechanically. That’s where occupational therapy helps you. Depending on the medical condition you needed treatment for; your doctors might recommend a change in food habits to suit the weakened state of your body. Our expert dieticians will help you by putting together a list of foods that you can safely eat and digest easily. As long as you’re living at our senior rehab facility, we will make sure that you get the customized meals needed. But, once you’re ready to get back home, our experts will show you how to cook them in your own kitchen. Our in-house respiratory therapists ensure that your heart and lungs are in top working order by the time you to go home. If you have been on a ventilator or using an oxygen mask, the therapist will help you learn to breathe without the aids. In addition to medication, you may also need therapy and exercises to help you clear breathing passages so that your lungs can function normally again. The need for lung expansion becomes critical if you’ve been dependent on breathing aids for too long. Accordingly, you will be trained in deep breathing and coughing so that the lung muscles regain normal functioning. Learning to eat and swallow food without risking it going down your airway is another skill you may have to relearn. Our speech therapist can help you with exercises that strengthen your vocal cords and throat muscles so you can safely speak, eat, and drink. In case your illness has affected cognitive skills like remembering things, reasoning abilities, and space orientation, you’ll need assistance and therapy to regain them. Our therapist will also direct your training in verbal and written communication, if needed. Recovering from an illness or surgery can be a difficult process for some of our guests. But, our professional therapists can help them get back on their feet. With the rest and rehabilitation you receive our facility, you will soon be able to live life independently and with confidence. 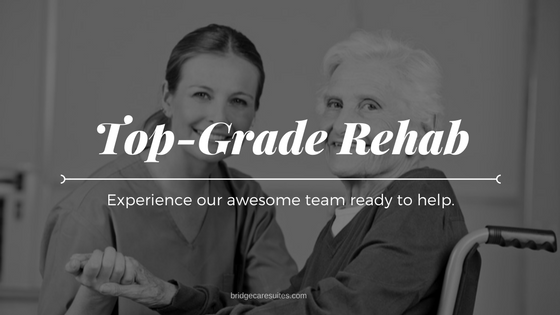 Contact us at Bridge Care Suites, Illinois Best Short-Term Rehab to learn more about our services.